This critique of the Eko Atlantic City environmental impact assessment, EIA has been the results of a week spent reading a library copy of the submission by the South Energyx Nigeria Limited, SENL to the Federal Ministry of Environment in Abuja. It is not aimed at arguing the credibility of scientific technicalities or at pursuing their verification as presented. The focus is rather on the project logic, the rationale, potential for impacts, the risk factor and the possibility as well as the capability to mitigate unavoidable consequences, but also to identify the necessity to situate a precautionary principle on what the project must not do. The analytical approach in this manuscript is however not devoid of scientific knowledge that complements information on governance and the socio-economic status of Nigeria. 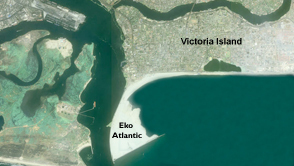 · Thus, the analysis of the EIA is not so much over claims by the proponents to protect the shoreline from erosion and drive economic development in Lagos at the conclusion of their activities, but more about the eventual and longer term impacts of constructing a city on reclaimed land from coastal marine sediments. The indirect effects of developments are often an order of magnitude higher than the direct effects assessed by environmental impact assessments. The construction of a new city on reclaimed and compacted marine sediments within a critical ecological system raises justifiable public concern over potential impacts, the clarity of the EIA process and the scientific credibility of its contents. It is for these reasons that the Eko Atlantic City project has generated current controversy and extensive debate. · The EIA is honest when it states that ‘public opinion’ is a risk factor. That a proposed project is queried by a concerned community or by concerned individuals is nothing new all over the world. It is difficult not to believe that the attitude of SENL and the Lagos State Government in not engaging with community members over the contents of the Eko Atlantic City EIA has not been deliberate in order to avoid the ‘Niger delta syndrome’ of communities making incessant financial demands for hosting projects. · Whichever way it is viewed, while it may be possible to hide the impact assessment of processes leading to the construction of a new city in the Eti-Osa Local Government Area of Lagos State, the activities on the ground will be obvious as they progress. That is when community agitation could emerge and grow into militancy and armed conflict. The genesis of the conflict in the Niger delta goes back to an unchanging and undemocratic governance culture in Nigeria that is anxious to propel development on the direction of a few ‘Captains of Industry,’ less on the views of the majority in the surrounding community. · For these and other reasons it is necessary for communities in Lagos that may feel impacted by the proposed project to avail themselves of legal advice on how to invoke the Freedom of Information Act (FoI) which affords unhindered access to information at the disposal of government and its agencies. It is impossible for millions of Nigerians, if they were interested to make their comments on a single EIA over 300 pages long, displayed in hard copy on a library table, without a website reference within a month. The EIA Unit of the Federal Ministry of Environment must find a better way of divulging information to the public or be constrained by law to do so. · EIAs have often been criticized for having too narrow spatial and temporal scope. At present no procedure has been specified for determining a system boundary for the assessment. The system boundary refers to ‘the spatial and temporal boundary of the proposal’s effects’. This boundary is determined by the applicant and the lead assessor, but in practice, almost all EIAs address the direct, on-site effects alone.The EIA of Eko Atlantic City is not an exception in many ways. · Many of the environment impact properties cannot be measured on a scale e.g. landscape quality, lifestyle quality, social acceptance etc. and moreover these indicators are very subjective. EIAs began to be used in the 1960s as part of a rational decision making process. It involved a technical evaluation that would lead to objective decision making. EIA was made legislation in the US in the National Environmental Policy Act (NEPA) 1969. It has since evolved as it has been used increasingly in many countries around the world. As per Jay et al. (2006), EIA as it is practiced today, is being used as a decision aiding tool rather than decision making tool. There is growing dissent on the use of EIA as its influence on development decisions is limited and there is a view it is falling short of its full potential. · The projected benefits of this project over which there has been much publicity, must be superimposed over the costs, risks and potential detrimental impacts around which there is silence. Perhaps it is traditional business practice to take risks. But where such risks are to human lives, extreme caution has to be exercised, and the people at risk, whether they be rich or poor, property owners or the homeless and landless must be allowed a voice in the decision-making process. · The public will be advised to watch out for the subsequent impact assessments on further phases of the project, while demanding for intensified debate on what has been submitted to date. Ideally an EIA must be followed by an audit. These audits serve the purpose to compare actual impacts to those that were predicted. Audits are the responsibility of NESREA, the National Environmental Standards and Regulations Enforcement Agency, a separate organization/parastatal within the Ministry of Environment. NESREA is hardly 4 years in existence and is overstretched in attempts to audit businesses nationwide. · In all of this, a problem is that many communities in Nigeria and their members are unaware of the existence of an EIA process, and even if they did, often lack the literacy and numeracy to know what to do with it. They must be empowered through capacity education programmes to take their destiny in their own hands. · It is important to find a solution to beach loss at the Lagos Bar beach and be prepared for sea level rise. The strategic option of sea defences is not new. Surprisingly the EIA does not cite ‘success stories’ and comparative case studies from countries around the globe that Lagosians could use as a reference base. People are anxious to know where a similar project in a developing tropical country has been successfully executed. · The Government of Lagos is in a hurry and has instructed SENL to complete the EIA for Phase 2 as soon as possible. What needs to be done is to convene a workshop of the stakeholders and interested groups and experts to come up with a written reaction to the entire Eko Atlantic City project, based on expert advice from within the country, and possibly from overseas. Opinions may differ, but it is always beneficial to understand why people are motivated to make decisions in a particular direction.